The St. Paul boys basketball team has come a long way in the last few seasons. In their third year under coach Todd Swan, the Bucks are 16-5, 12-1 in the Casco League. It is a far cry from the freshman and sophomore years of this senior class, during which the Bucks won just 10 combined games. Swan's team has won seven in a row, the latest being an 80-28 demolition of Livingstone Adventist on Jan. 31. "We get nit-picky as coaches, but when you do a 5,000-foot view of this team, this is the best seven- or eight-game stretch we've ever had here," Swan said. "It's exciting to know where they came from a few years ago. The hard work they've put in has paid off, and they're fun to be around." As of Monday afternoon, the Bucks sit atop the Casco League standings at 12-1. Perrydale, who St. Paul split the season series with, is second at 11-3. C.S. Lewis Academy, who the Bucks play Tuesday, is trailing right behind at 10-3 in league play. 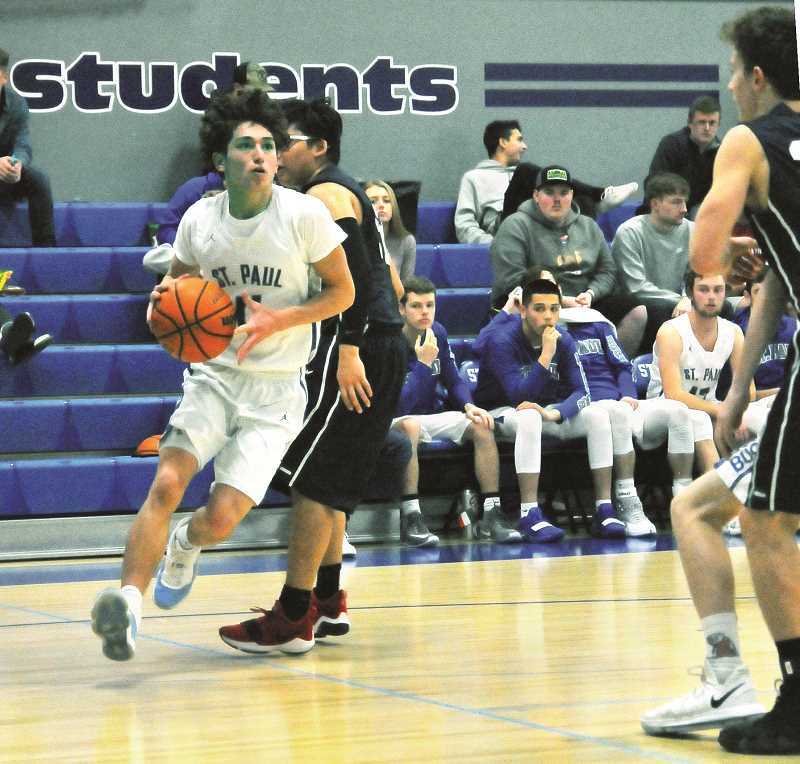 If St. Paul beats the Watchmen and takes care of Crosshill Christian on Feb. 8, they will clinch the No. 1 seed in the league playoffs and guarantee themselves a spot in the championship game. If they win the league title, they receive a significant advantage come state playoff time. The team is hoping to have its biggest post presence back for both league and state playoffs. Junior post Alex Dela Cerda visited doctors on Monday to determine the severity of a knee injury suffered on Jan. 21. "If it's a mild meniscus tear or strain, it's only a three-week wait, and he's already almost there," Swan said. "Anything worse than that would put him out for the season. We still don't know, and we're hoping for the best because we could use a big body come playoffs." St. Paul's game at C.S. Lewis Academy tips off at 7 p.m. Tuesday. After that, the Bucks face Crosshill Christian at home on Feb. 8 and go on the road to Falls City on Feb. 11. Gervais sophomore Alexys Zepeda punched her ticket to the 2019 Girls Wrestling State Championships after sweeping the competition with four consecutive pins in the 130-pound bracket of the Girls Northern Division Championships on Friday and Saturday. It's the second consecutive Division Championship for Zepeda, who qualified for state in the girls bracket before doing so in the boys bracket, where she went on to place third in the 3A 113-pound State Championships.